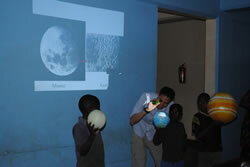 Sponsored by Scope City, Paulo Younse, a mechanical engineer at NASA's Jet Propulsion Laboratory, visited Amani Children's Home to talk about his work on robots destined to travel to Mars! 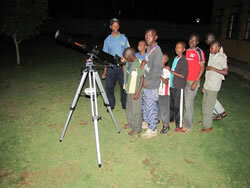 He gave a great talk about space and the solar system; all in Swahili that he learned especially for his trip to Tanzania. 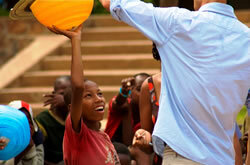 Paulo just returned from Tanzania. 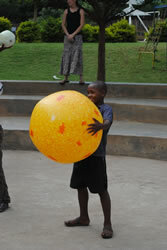 The visit to the Amani Children's Home was a success. He taught a 2 1/2 hour interactive lesson on space, the solar system, planetary exploration, and robotics! 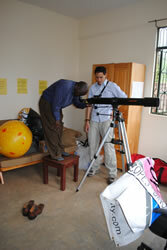 The telescope which was donated by Scope City made it safely to Moshi, Tanzania. In the evening they set up the telescope looked at Jupiter and its moons. It was an exciting day for everyone. 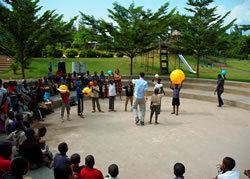 Kathleen Mahoney, Communications Coordinator of Amani Children's Home, told Paulo: "The children have been actively recreating what they learned with you. They were so engaged with the learning process of that day, that the information really stuck. They remain enthusiastic and excited about space. It is absolutely wonderful ! You and Scope City were a tremendous gift to both the children and to me".